Get Out of My Brain, Katherine Willis Pershey! Ministry cultivates a sense of loneliness among its practitioners. We learn about this before we enter the ministry, and personal and denominational support and accountability systems give us tools to guard against this. But in our secret heart of hearts, many of us ministers (and especially minister-mamas) hold deep, dark thoughts about our ministry, our families and our faith that we seldom dare admit to ourselves, pray about to God, or (heaven forbid) share with peers. How dare ministers confess that the burden of our work is so great, or that people really annoy us sometimes! It is much the same with motherhood. A “media-made motherhood mafia” tells us that motherhood should be one way glorious, marvelous, to be enjoyed even in the midst of sleep deprivation, and any revelation that it is hard and sometimes soul-crushing to parents is met with shock, horror and even anger. How dare women confess that the enormous privilege of motherhood is not all flowers, loving gazes and movie-perfect snuggling! So, to see so many of my terrifying, intimate thoughts written down in Katherine Willis Pershey’s memoir Any Day a Beautiful Change was at first disconcerting. I didn’t want to admit how much I recognized my own foolhardy beliefs, indeed my own self, right there on the page. “And despite reassurances to the contrary, I stubbornly insist that everyone but me is vividly experiencing God,” and “There is a common bankruptcy in contemporary Christian theology, and it’s that we’ve decided we don’t really want to take divine direction anymore. We don’t want God to get bossy.” There’s too much truth and pain in these words that I didn’t care to confront. I wanted to burrow under the covers, or cover myself in some other way, because I felt naked and exposed with all my secrets expressed on the page. No matter that the book didn’t have my name on it – she was clearly telling MY truth to everyone. Over and over, I had the sensation that Rev. Pershey had rummaged around in my brain, pulled out my secret thoughts, and in the most beautiful and resonant prose, offered them for the entire world to see. But as anyone who’s been in the closet or in recovery can tell you, sharing our deeply-harbored secrets in the bright sunshine does more than act as a disinfectant for our souls. It allows us to measure them in the light of day, rather than the shadows of our fear and shame. And – quelle surprise! – those secrets tend to be far less ominous, or even very big, once we can see them clearly. The more it happened, the more I took joy and consolation in knowing that I am not alone in this humanity as I, too, seek to be a faithful spouse and parent and pastor and self. Eventually, I found myself laughing, doodling the playful entreaty “GOOMB!” in several margins in the hopes that the author would please Get Out Of My Brain. “Some [people who walk labyrinths], myself included, try to get past the feeling that they have entered a zombie cult.” Praise Jesus – I’m not alone in finding labyrinths lovely in theory and kind of weird in practice. Or this: “As it turns out, I’m a delightful drinker.” As someone else who has a complicated relationship with someone who has a complicated relationship with alcohol, I quite accept the depth and mystery – even the joy and liberation – of such a realization. Rev. Pershey’s essays on motherhood ring clear, and cut deep. “I decided in that moment that I can’t always be the kind of mama to immediately fix it,” she says, citing an unwillingness to simply replace something that her child has lost. Being the kind of mama whose first instinct is to do just that, I find these words a life preserver that pulls me to a different shore. A shore in which we sit in the midst of our own and others’ sorrow with no promise but our presence, and trust that it will be enough. Every Day a Beautiful Change is nearly impossible to put down – several of my friends and colleagues report reading it deep into the night in order to finish, and I had a similar experience. Only sheer force of will let me put the slim volume down late on the night I received it, and I dreamed about the book that night and woke up desiring to read more. The raw truth she proclaims in vivid and engaging prose is relevant to all of us who seek to parent mindfully, whether we do so as ordained ministers, SAHMs, baristas or doctors. In short, this is a powerful collection of tautly-written, incisive essays that tell the deep dark truth about marriage, ministry and motherhood – all at once and in many permutations. While there is no overarching theme that builds all the essays together towards a final moment, each essay is incredibly powerful, and together they tell the truth about what it is be a young, married mother in ministry. In short: such a life is messy and painful, unfocused and scattershot – but it is also full of joy, presence, power, love and grace. If you’re called to it, it is the best gig in town, even if you have allergies or a sick toddler or a grumpy spouse (or all three on the same day!). Rev. Elizabeth Dilley served as pastor at First Congregational United Church of Christ in Red Oak, Iowa for nine years until she accepted a call to work at the national setting of the UCC. In her work on the Ministerial Excellence, Support and Authorization ministry team, she supports and empowers conferences and associations to create of nurture and accountability for authorized ministers serving in local congregations. She is married and the mother of one exuberant toddler. 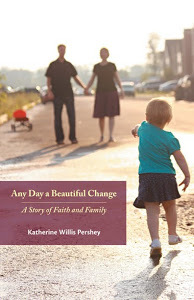 Tags: any day a beautiful change, book review, faith, Katherine Willis Pershey, parenting, pastor. Bookmark the permalink.